The spectre of boogiemania reappeared in Milwaulkee Sunday night at the Oriental Theatre in the form of two high decibel British rock bands, Thin Lizzie and Slade. An audience of about 1,300, most of them primed for the raucous festivities by various highs, first greeted Thin Lizzie, a basic rock formula group with a little more class than most heavy metal bands. Running through polished rock compositions, Thin Lizzie reached a high point with a taunting " Blues Boy," which halfheartedly struggled to be a B.B. King styled blues tune but ended up as a furious rock number. 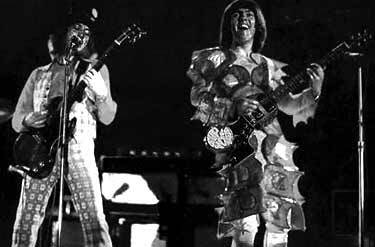 Slade, one of the premier boogie bands, took the stage with an energy that seemed forceful, yet practiced. Relying on little more than cranked up volume and extended, screeching guitar solos atop speakers, Slade offered a string of its hits to a frenzied audience. Slade seems to work up a huge sweat over nothing more than a few rearranged rock chords. Possibly because of Slade's reputation as a "party" band, audiences at Slade concerts pay precious more attention to partying among themselves than to observing the group. The only saving grace of bands like Slade's is their precision guitar work. Equipping themselves with two lead guitars that are played in rapid fire rounds, Slade almost stifles its audience with intense volume.